undertake a site induction prior to their first delivery at each discharge location. Tanker operators must contact the treatment plant operator (see below) to arrange a site induction. You may be refused access if you have not completed an induction. *Specific conditions apply to the discharge of tankered waste at unsupervised locations. Refer to the Tankered Waste Management Plan or your Tankered Waste Approval for details. For out-of-hours discharges, contact the relevant sewerage treatment plant operator at least 48 hours prior to the required opening time. All regulated waste handlers (including waste generators and waste transporters) must act in accordance with waste management legislation, including the Environmental Protection Regulation 2008. All tankered waste loads received at our discharge locations must have accompanying documentation as described below. A Queensland Urban Utilities Tankered Waste Docket2. Queensland Government Waste Transport Certificate1(unless waste transporter has an approved agency agreement with Queensland Urban Utilities and the Queensland Government). Copies of any electronic lodgements made under an agency agreement must be emailed to Queensland Urban Utilities at tankeredwaste@urbanutilities.com.au. Queensland Urban Utilities Tankered Waste Docket2. Queensland Government Waste Transport Certificate1 (unless waste transporter has an approved agency agreement with Queensland Urban Utilities and the Queensland Government). 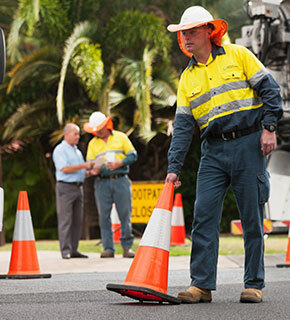 Copies of any electronic lodgements made under an agency agreement must be sent to Queensland Urban Utilities. Trackable waste is commercial or industrial waste of a type listed in Schedule 2E of the Environmental Protection Regulation 2008. Domestic waste is not trackable waste. (e) an office, shop or other premises where business or work, other than a manufacturing process, is carried out. (c) a boarding house, hostel, lodging house or guest house. 1 Waste transport certificates are purchased from the Department of Environment and Heritage Protection or call 07 3330 5677. 2 Queensland Urban Utilities provides Waste Transport Dockets for all tankered waste discharges. Docket books are located at each discharge location or can be issued on request without charge. Call us on 07 3432 2032 (3:30am – 4:30pm weekdays) or email us. Waste transport certificates are purchased from the Department of Environment and Heritage Protection (EHP) in books of 50 certificates. Payment methods include credit card and cheque (email waste.track@ehp.qld.gov.au or call 3330 5677). Payments can also be made online by credit card at www.ehp.qld.gov.au. Queensland Urban Utilities provides Waste Transport Dockets for non-trackable waste (i.e. Deemed Quality Tankered Waste from domestic premises). These docket books can be collected at our discharge locations without charge.